I am honoured to publish this ‘guest feature’ on the MeshWORKS conecept by the remarkable Bjarni Snæbjörn Jónsson. His main research interests lie in large systems development through public participation. He was a founding member of The Anthill in Iceland which organized a cross-sectional National Assembly in 2009 involving abt. 1000 randomly sampled citizens which were physically joined for a day to formulate the Icelandic nation‘s future superordinate goals, following the financial crisis of 2008 which hit Iceland particularly hard. These goals were at the centre of the drive for constitutional reform which has dominated Icelandic politics since. 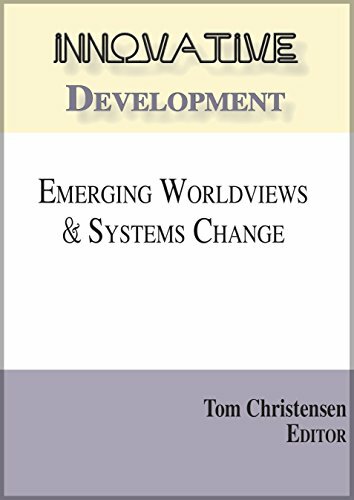 Bjarni’s feature originally appeared in Innovative Development: Emerging Worldviews and Systems Change (Integral Publishers, August 2015), edited by the late Tom Christensen. It is reproduced here with Bjarni’s express permission and encouragement. With the exception of some minor formatting changes and a several links added, it is reproduced exactly as it appeared in ‘Innovative Development’. To maintain the integrity of the piece as published, I have retained Bjarni’s use of the SDi terminology. However, for the purposes of this site, readers should effectively susbstitute ‘Gravesian’ for ‘SDi’. The truth is not to be found in books, not even good books. The above quote from the late Icelandic novelist and Nobel Laureate Halldor Laxness reflects well the basic philosophy behind this chapter. It is based on a research project that has, to a great extent, evolved from a search for a truth – not the truth, but a truth within a human system that finds itself in times of trouble. Another anonymous source has it that the truth is not only that of oneself, but must be sought in encounters with other people who have their own truth, and must bear in mind 3 basic principles: acceptance, respect and understanding. The question is: to what extent can a citizens’ communicative engagement contribute to what could be referred to as ‘conscious social evolution’? The backbone of the research outlined below is a large-scale dialogue process initiated by a grass-roots group in Iceland called The Anthill. This 2008 process was followed by multiple similar events and one large-scale dialogue event organized by the Parliament of Iceland to initiate the rewriting of the Icelandic Constitution in November 2010. Since then, the same model has been applied in Scotland, raising a high degree of awareness and interest there as well. The dialogue process, called ‘The Assembly Process’ has now been used for a wide variety of issues ranging from specific organizational strategies to a visioning project for a whole nation. It is based on theories on participative action inquiry, dialogue and public spheres. This carefully structured and facilitated process can create an environment of safety and creativity where every opinion counts. This was an emergent process conducted in life conditions within the human social system and nation state of Iceland. In the early part of this process Iceland‘s 2008 financial collapse occurred which was a powerful disruption to systems throughout Iceland. This event became an invaluable resource for researching a large-scale human system. We were presented with dynamics and responses to this sudden change that revealed profound impacts on the identity and overall wellbeing of the system. Further, the situation provided opportunities to study the overall challenges of the society, its life conditions and ways of thinking that, in many ways, led to the crisis. What emerged from the research was a model, called the ‘Conscious Social Evolution Model’. This model outlines a study of causality and the forces that shape human systems for better or for worse. Change congruent with vMEMES: new policies and suggestions for action are more likely to be accepted if grounded in the social system’s core vMEME intelligence. The underlying thesis is that these assumptions hold for every kind of human social system. They are components of the model for CSE shown in below and further discussed in this chapter. CSE is a management model based on the premise that a living system must either adapt to its environment or be unable to cope with the constant environmental change, eventually ceasing to exist in its present form. The adaptation is a highly complex dynamic, and due to the inherent autonomy of the system components, cannot be managed in the traditional sense. Although some may claim that it would be best to leave this complex system alone, I argue that such evolution of human social systems should not be left to chance or be willfully unconscious. Although there are many historical events that justify this argument, it is sufficient to refer to the financial crisis of 2008. The lower half explores ways to harness the collective intelligence to create effective action plans. This model ensures that we formulate an action pathway that is based on the premises of the human system itself. The Assembly Process previously mentioned was a significant setting for harnessing this collective guidance. It was noted in terms of the desired future and comments on how that future relates to respondents’ beliefs and attitudes. The model also involves ways and means that allow a vision to emerge from the Assembly based on the visionary highlights chosen by the participants. These highlights were chosen using an analysis model called ‘the Social Tectonic Plates’ that emerged from the 2009 Iceland National Assembly data. The CSE model furthermore involves tools that enable a holistic approach to systemic intervention. Coalescing authority, power, and influence (CAPI) is an important element of the model. 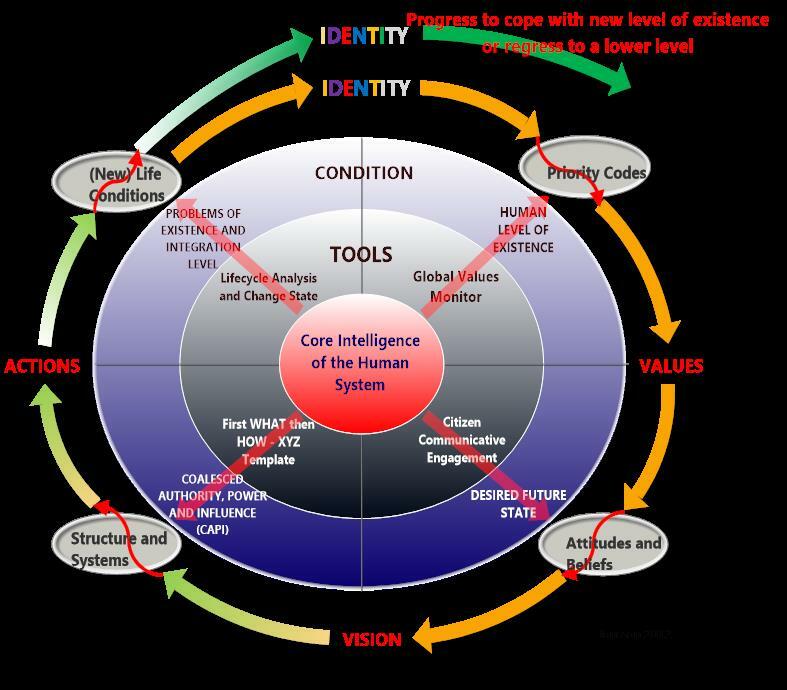 CAPI as it relates to the human systems change process is addressed in more detail below. If there is a change in life conditions manifesting itself in disintegration resulting in misalignment between the human social system and its environment, the situation becomes unhealthy – effectively a mismatch between the neurological levels. These changes can occur rather suddenly, such as in a war or natural disaster, but they could also be a gradual imbalance. Such changes inevitably threaten the identity of the system, resulting in fear, insecurity and denial. Under threat, the system would tend to express its values in a limited or negative fashion, such as corruption, short-term thinking, blame and so on. The beliefs and attitudes would then distort the common vision, which would lose its superordinate nature and become fragmented, leading to further disintegration within the structural elements of the system…and on it would go. Given that a human system could only evolve on its own terms, taking into account its underlying mental and structural capacities to deal with different levels of complexity, any meaningful intervention would have to be with a deep understanding of the system itself. Take the nation state of Iceland, a small, homogeneous but developed and complex modern society. Since 2005, I have conducted quantitative research of the Icelandic nation’s overall cultural traits. I also made extensive use of secondary sources, particularly a report on the financial crisis issued by the (Althingi) Parliamentary Special Investigation Commission (2010). The findings were put into the perspective of lifecycles to assess the system’s overall level of adaptation to its life conditions. The conclusion was that prevailing life conditions seemed to have exceeded the collective cognitive capacity (Iceland was experiencing ORANGE life conditions with a collective vMEME profile strong in RED and weak in BLUE). With privatized banking and a world awash in money, Iceland got ahead of itself in enjoying perceived success financed by foreign debt. The situation was a sort of fool’s paradise: perceived success, limited understanding of its causes, and totally lost overnight. The key question here is then: how the the human system’s collective worldview elicits a response to perceived life conditions, leading to either healthy or unhealthy beliefs and behaviours. The quantitative surveys carried out in 2005, 2007, and 2009 regarding the prevailing vMEME systems revealed that a poisonous mixture of egocentric, power-based thinking (RED), together with strategic means-justifies-the-end thinking (ORANGE), had become dominant in this era of material success. Other quantitative surveys on values in terms of beliefs and behaviour conducted in 2008 and 2010 using the methodology of Barrett‘s Value Centre, showed a high degree of malignancy and entropy within the system, indicating a high degree of fear and limiting values. When things started turning in the wrong direction, a strong confirmation bias took over (as explained in the Parliamentary Special Investigation Commission’s report), leading to total denial and ultimately a financial crash of much larger proportions than anywhere else at that time. The result was not only a massive blow to the nation’s financial situation, but its very identity – that of a superior, overly optimistic, high-risk culture capable of turning everything it touched into gold. It came as no surprise that the nation’s response to the financial crisis was great fear, anger and the search for someone to blame. Public protests and riots of unprecedented proportions occurred in the first months after the crash. The incumbent government was ousted and a massive criminal investigation initiated to prosecute those thought to be responsible. The situation was characterised by mistrust, blame, corruption, and more, as revealed by another quantitative study I carried out in cooperation with the Barrett Values Centre. It is difficult to establish with credibility that the Assembly Process is responsible for such direct visible effects as attaining certain measurable national objectives. However, it was concluded that the process is a viable alternative in participative democracy since it was applied to the rewriting of Iceland’s constitution. A pilot event in Scotland has already led to serious discussion toward wider use of the tool by various societal bodies.